At the March 16th meeting, in honor of National Women's History Month, President Becky Shoulberg and incoming Vice President, Sue Soriano welcomed Vaneta Lorraine from Cranaleith Spiritual Center. The property has a long herstory as matriarchal Lenapes lived throughout the area. Mill-Rae, a Victorian home commissioned in 1890 and completed in 1891, was designed by architect Minerva Parker Nichols on behalf of Rachel Foster Avery, a national figure in the women’s suffrage movement and a close friend and ally of Susan B. Anthony. Anthony herself stayed at the home many times during her speaking tours around the country. This year (2017), Mill-Rae was listed on the National Register of Historic Places. Currently the property has a conference center run by Sisters of Mercy. They offer diverse programs and workshops. Plus, they oversee a community garden and beehives. On Thursday February 16 at Pepper's we had a screening of Our Way Home with Producer and CMC student member, Alexis Werner. At age 14, Alexis co -founded Seeds for Change, a community garden program in Pittsburgh. She is a past National Liberty Museum Young Heroes recpient. In December, presents collected at our Holiday Party were presented to Montgomery County Veteran Center for a Marine family in need. CMC BPW also donated to Norristown State Hospital and Parkside Adult Day. November was a Bring the Bling fundraiser with Karen Alder from Premier Design Jewelry. Donated jewels will be raffled at the 90th Birthday party in May 2017. 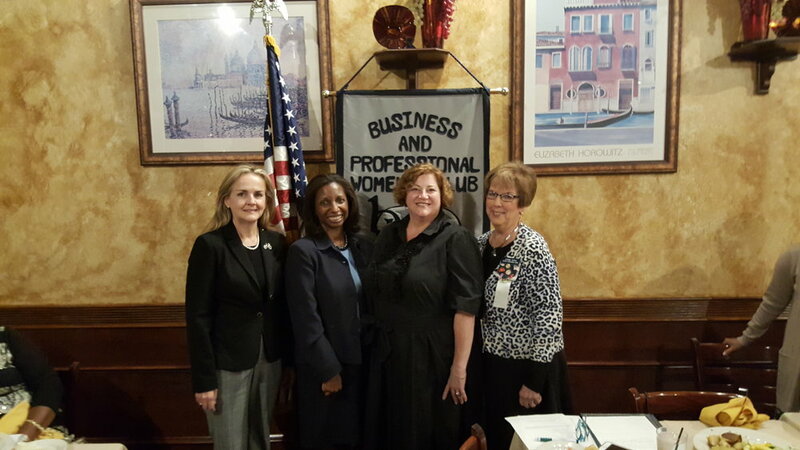 CMC's Woman of the Year recipient, Judge Cheryl Lynne Austin (second from left) with Represenative Madeleine Dean, President Becky Shoulberg and District 11 Director, Joanne Hersh. In 2011, her Honor was the first African American woman judge elected to office in Montgomery County. Dozens of colleagues spoke so highly of Cheryl, her kidness, dedication and the ability to foster a harmonious work enviorment. Cheryl spoke about how she could not have achieved her success without family, peers and the mentorship and support she could always count on from BPW. She is our favorite glass ceiling smasher! Katie Macklin from Delaware Valley Alzheimer's Association kicked off CMC's 89th year with a talk about the different types of dementia and resources for caregivers including a 24/7 hotline: 800-272-3900 and alz.org/delval.